I purchased this fried egg fabric some time ago in a local quilt shop. I was not sure what I would make from the fabric, but as a chicken collector, I knew I had to have some of that wonderful egg fabric. I recently came across the chicken fabric on the left. 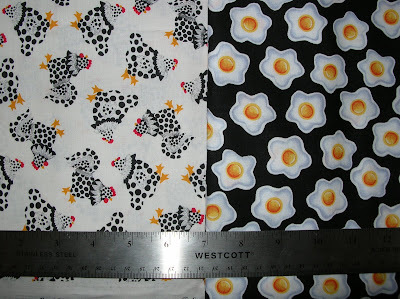 I knew that this fun chicken fabric would be perfect paired with the fried eggs. I had a lot of fun looking through patterns trying to decide which pattern would best showcase these special fabrics. 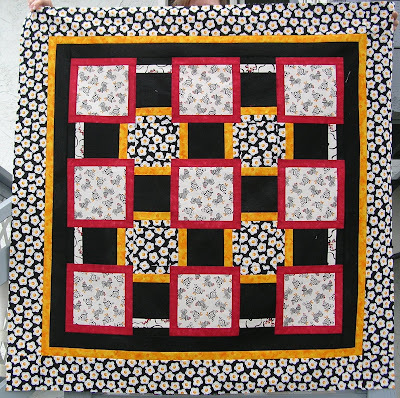 I came across a quilt on the Internet that reminded me of Quiltmaker’s Warm Wishes quilt pattern. LindaJ reminded me that the quilt was also a lot like Atkinson Designs’ Tile Tango pattern. I worked backwards from what I wanted to see as a finished size for this quilt. I wanted this quilt to finish approximately 45 to 50 inches square. I drafted the design on scrap paper and figured out how many strips and what size of strips that I needed to cut out of which fabric. This is the resulting flimsy, Which Came First….the Chicken or the Egg? This entry was posted in chicken or egg, flimsy by Norma Hanson. Bookmark the permalink. You used Chicken fabric! I am still a bit taken aback by the prognosis… Are you o.k.? Amazing how much quilting time there is when the computer is down! Love the chicken fabric. I love how this quilt finished out. Good use of the focus fabrics and I repeat, that yellow is the perfect shade for this! No such thing as too bright as this is the same shade as those egg yolks. I believe that in this case you had the eggs were first–chickens came later in the purchasing area. Well done at any rate! What fun fabric and what a great quilt you’ve made out of it!! I have several yards of that fried egg fabric. It’s so adorable. I LOVE, LOVE, LOVE what you did with it and the chickens! I agree with Linda- this is a very cute top! can’t wait to see it quilted up! I love the quilt. My friend just made a rooster quilt with similar colours and it looks fabulous. There is a photo on my blog!